Despite our exhaustion from the long journey, we were all excited to finally arrive in Malawi as we walked down the steps from the aircraft. We landed in the Shire Highlands of the country, in Blantyre, its second largest city. The landscape caught our attention, on one side of the runway, there was a small mountain while the other side was completely flat. Last summer, members of our Engineers Without Borders (EWB) team completed an assessment trip. The team travelled to Solomoni, Malawi, our partner community, where they met with local officials and members to develop a water project that would address the community needs. Specifically, the community identified that school children were missing valuable classroom time to collect water. They would have to walk to the closest borehole, wait in line, pump their water, and then walk back to school. The community needed closer access to water and more distribution points to keep the children in the classroom with the goal of improving academic performance. Throughout this past year, the Tufts EWB team took this information and began its preparation for the first implementation trip, with the primary goal of drilling a closer borehole and installing a handpump. Now that we were here in Malawi, in a village several hours outside of Blantyre, the drilling of the borehole was our main task to accomplish in the next ten days. Upon our arrival to Solomoni, we met with members of the school committee, water board, and the collaborating NGO. We all looked forward to working together. The initial drilling of the borehole was delayed as we attempted to agree on certain specifications in the contract with Eazy Borehole Drillers. While we waited, we used our time to prepare for the next implementation trip, the goal of which would be to install a solar-powered electric pump that will pump water into a water tank. The water stored in the tank will be transported through a piping network to allow for multiple distribution points around the schools. We gathered GPS coordinates and distance measurements to create a map of the community that we could refer to once back at Tufts, when we begin planning this next phase. 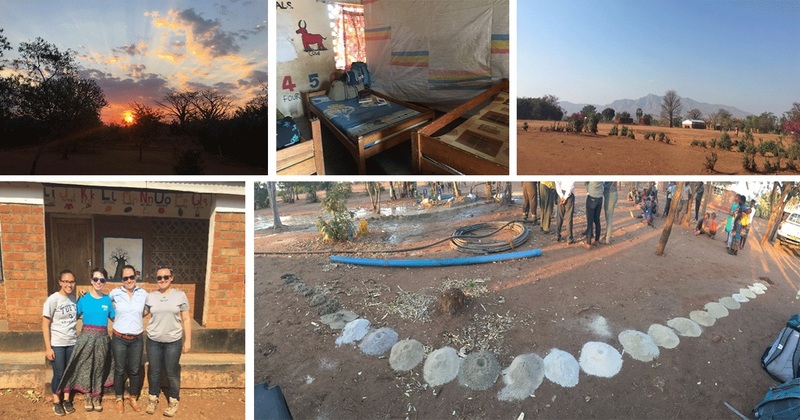 Some of us also went into Blantyre to gather quotes for the materials we will need on the next trip, such as solar panels, submersible pumps, water tanks, and pipes. Finally, after agreeing on a six-inch drill bit size, drilling was able to commence. With large and loud machinery, many members of the community –especially children –gathered around the drill site to observe the exciting drilling of the new borehole. Each time a new drilling rod was attached and inserted into the borehole, a drilled mineral sample was collected. We could tell when we were approaching water since the samples became more moist. One of our favorite memories from the trip was when one of the nearby children who, using a stick, “drilled” his own hole and collected small piles of top layer soil in an effort to mimic the drillers. It was definitely obvious when the drill bit struck water. Mud was projected into the air like a geyser. It was a relief for our team to know we had accomplished the trip’s main goal of drilling a viable borehole. The children, especially, enjoyed watching the rest of the drilling now that mud shot into the air every few minutes. It was exciting to know that we helped facilitate the drilling of a new borehole that these children would be using when they returned to school in the next few weeks. Throughout our stay in Solomoni, we interacted with many adults in the community, yet on one of our last days we had a chance to interact with the school-aged children. To teach the importance of handwashing in a fun manner, we played a game of tag. In the first round, the children who were “it” had flour on their hands, and each time they tagged someone, that person got flour on their hands too. However, in the second round, children were instructed to wash their hands before returning to the game. The flour represented germs to demonstrate how handwashing is an effective way to break the cycle of disease transmission. Leaving Solomoni on our last day was absolutely difficult. In such a short amount of time, we had become friends with so many people. As a team, we were happy to have successfully facilitated the drilling of the new borehole. Moreover, we felt confident in all the additional quotes and data we were able to gather, as they will surely help us prepare for the next phase of our project. It was definitely a productive and fulfilling trip!